From my apartment window, I watched a light drizzle fall over the city while below Parisians went about their daily business without giving the raindrops much notice. Not a single umbrella among them, they adaptated over the years to the wintry conditions of perpetual powdery grey skies followed by rain followed by a slant of sunlight and then repeated. I was wondering when I'd be so blasé about walking in the rain when I noticed it began to fall a little harder, the city folk quickened their pace and the energy changed. Raindrops intermingled with small flecks of white and before long giant snowflakes draped the landscape. In an instant, the sky was a magnificent spray of white. Excuse my gushing, but this was my first witness of a real-ish snowfall in Paris, it was like seeing snow for the first time! I just LOVE that second photo! ...and I'll have to think about how long it was until I learned to just walk in the rain. But I sure did. I remember the daily school drop off and pick up walks...often under the drizzle or rain. And rarely with an umbrella! It had to be a total deluge to even consider an umbrella. So glad you had 20 minutes of magic! Looks like a post card my friend. You have the proof, and I'm glad I get to see it, Catherine. Too bad your boys didn't get to play in it. snow in Paris - magical! Stay warm and enjoy! I could do with some snow here. Snow in big cities is so magical , for a moment the streets are dressed uo-before it turns dirty again. Great that you took the pictures to proof that Paris had its day of winter. 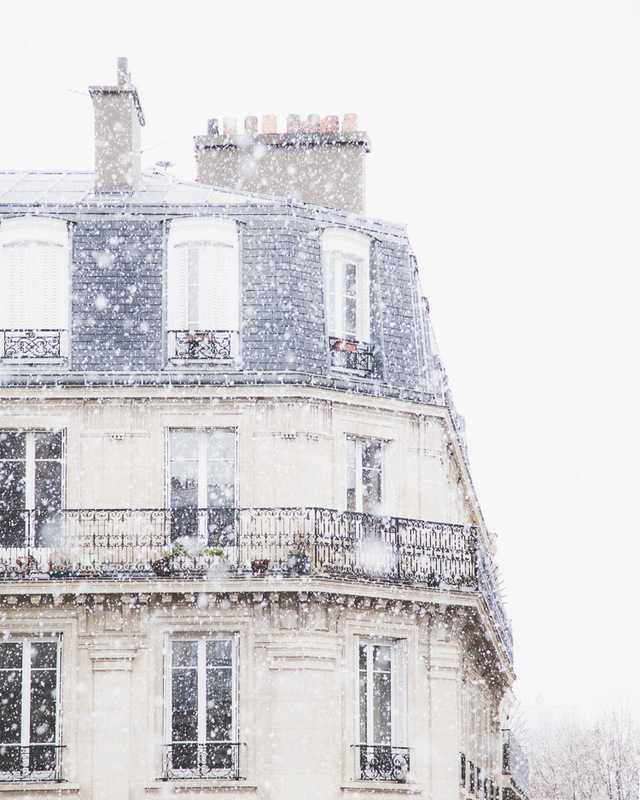 SO beautiful, and of course snow in Paris would be exceptionally beautiful. It almost makes me forget how very, very tired I am of cold and snow. Don't know if my comment came through... so here it is Delightful and magical snow! It seemed it came late this year in W.-Eur.! you have captured it beautifully. Breathtakingly beautiful! And you had a front-row seat for the splendid show! What a gift! I think I love falling snow almost more than snow that lingers. This is magical and I love these! That is gorgeous and simply magical looking!! It definitely snowed. It looks like it was more than a little too. I am glad that you got the photos to prove it lol. Very elegant wintry photography! Beautiful! 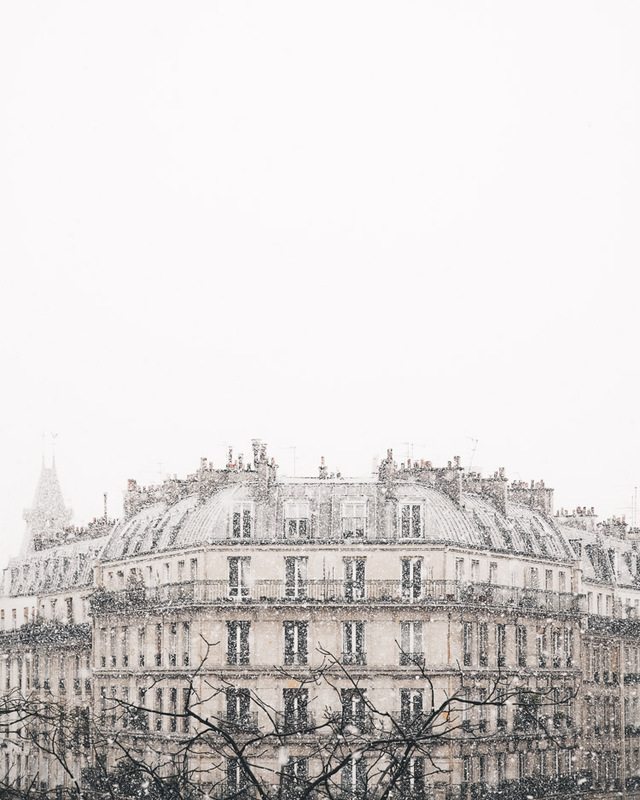 Paris is magical, but add snow (it wouldn't dare stick to the ground in Paris) ... wowzer! Beautiful images. VERY lovely shots. It appears to me that you live in a very nice building. Or at least a very nice neighborhood. :) I've had the pleasure to slush around Paris a couple times, but my experiences were much more gray than yours. Oh, that is so beautiful. Gorgeous view. Our first trip to Paris it snowed in early March. No denying it - snow on the Eiffel Tower and snow on the Rue Clerk, snow was everywhere and it was soooo cold! Your photos remind me of that visit!! The city looks so different under the snow: much more delicate, almost magical. And your pictures do render this fleeting instant perfectly. For me living in the south of India having tropical climate, snowfall seems to be blissful..